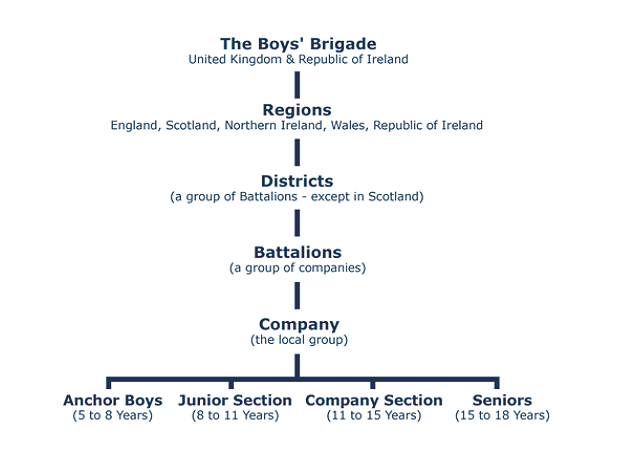 The Boys’ Brigade's structure has over 1400 groups known as Companies across the United Kingdom and Republic Ireland. These Companies are organised into local groupings known as Battalions & Districts which provide support and activities within their geographical areas to add to the experience of young people and leaders. The Boys’ Brigade is a registered charity (in England & Wales 305969 and Scotland SCO38016). The Trustee body is known as the ‘Brigade Executive’ and is made up of elected representatives from the five regions. All Brigade Office Bearers and Trustees can be contacted through Assistant to the Brigade Secretary via BB Headquarters.